The second flight test of NASA's Low-Density Supersonic Decelerator (LDSD) will be attempted on Monday, June 8 at no earlier than 1:30 p.m. EDT (7:30 a.m. HST), launching a rocket-powered, saucer-shaped test vehicle into near-space from the Pacific Missile Range Facility on the island of Kauai in Hawaii. Editor's update: NASA has delayed the launch of its Low-Density Supersonic Decelerator to no earlier than Monday (June 8), at 1:30 p.m. ET. The story below has been updated with new launch target times. NASA now aims to launch a flight test Monday (June 8) of an innovative "flying saucer" that could help humans land on Mars in the future, and you can watch the dramatic action live. The space agency's Low-Density Supersonic Decelerator (LDSD) test vehicle is scheduled to launch from the Hawaiian island of Kauai no earlier than 1:30 p.m. EDT (1730 GMT; 0730 local Hawaiian time) on Monday, borne aloft by a giant balloon. You can watch the test live on Space.com, courtesy of NASA TV, beginning at 1 p.m. EDT (1700 GMT). The launch was originally slated for June 2, but NASA has delayed the flight repeatedly due to strong winds and rough ocean conditions. 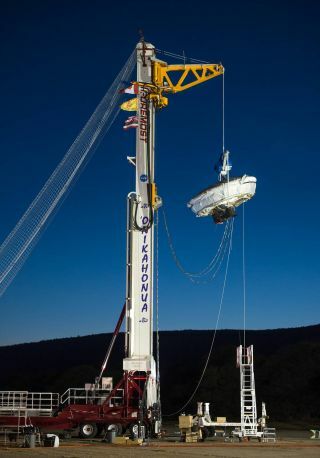 The LDSD system consists of a saucerlike "supersonic inflatable aerodynamic decelerator" (SIAD), along with a 100-foot-wide (30 meters) supersonic parachute. Together, this equipment is designed to help get superheavy payloads, including human habitat modules, down safely on the surface of Mars. NASA's current Mars-landing tech can handle equipment no heavier than 1 ton or so, space agency officials have said. This current gear — a rocket-powered "sky crane" paired with a 51-foot-wide (15 m) parachute — was thus pretty much maxed out by NASA's Curiosity rover, which touched down on the Red Planet in August 2012. The SIAD will then inflate, rapidly reaching 20 feet wide (6 m), while the LDSD vehicle is going about three times the speed of sound (Mach 3). The resulting increase in drag will help slow the test craft down to Mach 2.35, at which point the huge parachute will deploy, allowing the vehicle to make a soft splashdown in the Pacific Ocean. Monday's planned test will be the second LDSD flight; the first lifted off last June, also from Kauai. The parachute was torn apart shortly after deployment during last year's trial. This second test will feature a modified, stronger version of the supersonic chute, LDSD team members said. While NASA hopes to launch the LDSD vehicle Monday, uncooperative weather may well push the test back by several days. Indeed, the test was originally scheduled for June 2, but mission team members have postponed it repeatedly because of strong winds and large waves, which could hamper vehicle-recovery operations, NASA officials said. "I'm hopeful that by the end of the week or by early next week, we'll have some better opportunities," LDSD project manager Mark Adler, of NASA's Jet Propulsion Laboratory in Pasadena, California, said during a prelaunch briefing on June 1. The current LDSD launch window runs through June 12. A second window is also available from July 7 through July 17.